We love nature when worms eliminate our garbage, do our rototilling and enrich our soils. 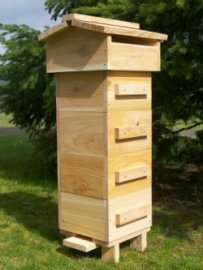 As bees and butterflies float by to pollinate our cutting flowers, our geese chase away the door-to-door salesman, and our goats trim the wild brambles, we relax back and enjoy nature as our partner. There's a deep, building sense that we belong, that we're partners in the building of some grand plan that wants us here, and wants us to stay and co-create it. Until the coyote attacks our sheep or the hawk flies off with our prize laying hen, that peaceful 'one' splits in two: Us vs. Them. Now it's war. 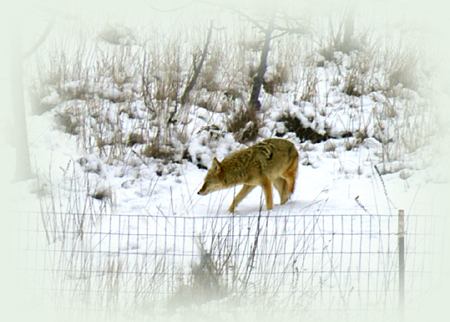 Peace amidst predators, even… coyotes? One such incident came to me from a distant neighbor, John Langdon. A retired park ranger, one sunny afternoon he told his neighbors about the wild coyote that was patrolling his property, keeping other coyotes away, eliminating unwanted rodents, but leaving his waterfowl alone. I'd always loved how John fixed up his front yard with a little pond for his ducks and geese to swim and lounge about. And by now, I had learned that in spite of humankind's ability to reduce or eliminate countless predators, including nearly driving bald eagles and wolves to extinction, one large predator refused to back off, the coyote. A beautiful coyote made its rounds near my property, and I wanted to find some way to work things out with these guys. So naturally, when this park ranger told me his "coyote story," I perked up. Surrounding my Island Meadow Farm are hay fields, small family acreages, and an organic cattle ranch. The coyotes were known to invade the fields and kill pets and farm animals. They were shot, and interestingly, when one was shot, another filled its spot. That's how nature works. It's a natural phenomenon observed for years. Jonathan G. Way, PhD www.easterncoyoteresearch.com. (Jon), is a wildlife biologist, high school science teacher, and author of Suburban Howls, which documents his incredible field studies on coyotes. "If a resident coyote group member(s) dies," Jon says, "it seems that coyotes communicate very quickly that this area has an opening, and either the dead coyote's mate attracts a new coyote and/or a transient/nomad finds that there is an opening because of a lack of scent marking and/or howling in a given area." Below our hill, I stopped and talked to that neighbor while taking a walk. He also used to routinely kill the coyotes to protect his flock of geese and ducks around his pond. But one day, he saw a female coyote with a broken leg, and had the notion to feed her instead of kill her. DO NOT DO THIS YOURSELF! It can be very dangerous. It's described here because there's far more to the story of a possible solution regarding coyotes and other predators (even flying ones) and this plays a part in it. This was a park ranger with a strong sense of the wild, living in a rural setting, so his experiment should never be casually mimicked by the general lay person thinking it's a good idea to feed wild animals in any setting, including urban. Coyotes need to remain wild, rather than become our lazy, over-populated dependents. In this case, she recovered and remained wild, but as her natural instincts allowed, she now saw the man who fed her as part of her pack. Though not exactly the same, coyotes form packs and family bonds somewhat similar to wolves. Animal bonds can cross to other species, including humans, if certain conditions prevail. Human bonding with wolves, domestic canines and parrots has proven this to us for centuries. It appears the park ranger was the only human she got close enough to observe once she recovered. Experts are well aware that coyotes can come to treat individual humans differently than others according to what they learn about them. They can learn to run away from certain people while they ignore certain other people, or even attempt to warn one human to stay away if they think the human has an interest in coming too close, while they have no concern over another human that comes near. Jon has witnessed this during his field studies. "Many animal control officers know that coyotes and other animals (dogs) recognize them and/or their vehicle," Jon says, and described how the animals came close to some humans, but ran away quickly when the officer arrived. In other words, any person who chooses can become "an officer" to a coyote by being assertive. "I absolutely believe that they can be conditioned to stay away from people doing simple non-lethal things (such as throwing rocks or making loud noises) and killing is not the option. In my book, I also describe a similar scenario where coyote packs have reacted angrily to my presence - barking at me near a den site (Jon humanely trapped and then released coyotes for his study). However, those same coyotes literally ignore other people including many golfers on a golf course." It's also been confirmed coyotes have learned to live with the automobile, and even train their pups how to cross the street at night to avoid being hit. According to Stan Gehrt, Ph.D., assistant professor and Extension wildlife specialist at Ohio State University, coyotes train their pups, especially in urban areas, how to safely cross a street. In fact, urban coyotes get hit less often than rural ones, since they are confronted with the situation more often, and have learned to cope and how to teach their young. Coyotes can certainly treat humans as individuals, and quickly develop new interactions with humankind. What made the peaceful situation with the coyote happen, and can others make something similar happen? Back to my neighbor: His territory became her territory. Biologists know that coyotes and other predators are extremely territorial, and will vehemently protect their territory from other canines. So it's easy to see how this coyote would keep others off her territory, which in this case included the park ranger's land. Jon explains that coyotes maintain low densities and purposely don't interact often. We also know that coyotes are sometimes loners by necessity, and can survive this way. "Very often," says Jon, "pups or yearlings, when they decide to leave their parents, are loners (hence nomad/transient). They seem to be nomadic until they can find a territorial opening." But intriguingly, when a wild predator has been conditioned to avoid a certain food source it previously may have found desirable, scientists have witnessed these animals inadvertently 'protecting' that food source from others of their species. As described by Lowell K. Nicolaus, PhD, who used the method described more below to condition (treat) ravens to avoid eating certain eggs, "At the refuge, breeding pairs of ravens defended their territory against intrusions by the many non-breeding ravens. In effect, treated (conditioned not to eat the eggs) territorial ravens that refused to consume the eggs themselves, "baby sat" the surrogate eggs by protecting them from predation by others that had not been treated." Though my neighbor's coyote somewhat kept her distance from him as she hunted the coyote's favored food supply on his property -- small rodents -- she eventually came near the man's pond and water fowl, he even saw her running through them, but she left them alone while she hunted the rats and mice. Coyotes have been helping farmers and ranchers for years by keeping rodents in check as they hunt through hay fields and near cattle ranches. In those cases, there are no small enough pets or small enough livestock on these farms the coyote would also like to eat, so they live peacefully with these farmers. But coyotes do eat birds such as John's ducks and geese, yet in this case, the coyote also saw the poultry John left at peace, and she did the same. In fact, it began to happen repeatedly, and she never harmed his waterfowl. How could that happen? It's known that canines, and maybe even especially coyotes, can learn and change their previous behavior, and can be conditioned to new behavior. Our domesticated canines demonstrate this ability often, choosing to avoid otherwise food or competitive animals, such as the family pet guinea pig it would otherwise devour. And coyotes, being both live hunters and scavengers, can't survive without their ability to train themselves not to eat certain foods that they otherwise would enjoy, just as they must train themselves not to cross the street when a car is coming. A food or water source that has become tainted with disease or poison that makes the coyote ill must and will be avoided by that coyote, assuming it survives the ordeal. Edibles that have a unique way of escaping easily might not be worth the trouble, either. So, even though coyotes can and do swim, waterfowl wouldn't usually be the game of choice over small land animals, especially if an ample supply of rodents were around. 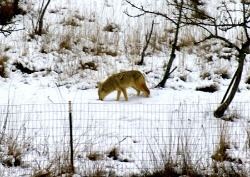 And for this particular coyote, a larger lake with many wild waterfowl is nearby, across the street from John's. Coyotes forage in these areas, and can quite quickly and easily learn that wild waterfowl with access to a large lake aren't worth the trouble. The coyote never witnessed her human, nor other canines wild or otherwise, succeeding at catching the waterfowl, so there was most likely no reason to resort to something she'd conditioned herself to avoid. So, this park ranger enjoyed a very odd situation with a coyote running through his ducks and geese to eat rats and mice without harming the poultry. She also protected "her and his" territory from other coyotes who may have harmed the birds. So he relaxed back, allowing a coyote, of all things, to protect him from coyotes. But how can others mimic this unusual and admittedly non-replicatable beneficial situation? As mentioned, in most cases, purposely feeding coyotes has proven devastating. How did this incident strike a rare balance with nature where others fail? And can it be adapted to others' situations? It seems it definitely can when looked at very closely, and replacing this coyote's unique, hard-to-replicate situation with another that's proven effective in almost all situations. Thanks to the biologists and others who have performed long and serious studies, we have a lot to work with to begin re-creating this new balance. The very thing that makes coyotes seem so much our enemy, the fact that they eat such a large variety and train themselves to take new foods such as our garbage, pets and livestock, is the very thing that can help us live with them. We can use their ability to learn new food choices because it goes right along with their ability to learn to avoid old ones. Here's what we know so far: Coyotes, like other predators, will protect their territory (and yours) from other coyotes and dogs. If the resident coyotes that frequent your property are conditioned to leave certain areas and livestock alone, they will keep other unconditioned coyotes out of the territory which would otherwise cause trouble. In turn, they naturally respect another's territory, and they can be conditioned to leave certain areas of your farm alone. Jon suggests throwing stones and chasing them with loud noises, and many farmers have had luck keeping larger livestock guardian dogs on their property (see more about how to do this below), especially when we humans can't get to them at night when they hunt. They can pass learned or conditioned information on to other coyotes in their pack or family, making it less time consuming to 'train' many different coyotes. "If you don't want them on your property for whatever reason, you should chase them away, throw rocks, and make loud noises," says Jon, and again, this applies if you can get to the coyotes when they're present. "Chances are, over time, all of the resident coyotes will learn that it is not worth wasting time spent on your property. Even though they travel long-distances, they are territorial so only a few live in a given area. I am sure packs will communicate with each other to avoid (or go to) a certain area. I am 100% convinced coyotes teach each other all the time by communicating regularly." When one is killed, another almost instantly fills the gap. Killing doesn't work and should be resorted to only in a surprise emergency, followed by more long-term effective methods for the next coyote that will inevitably show up. They can also be conditioned to leave certain otherwise food animals alone. This is where I want to present even more findings on the topic of coyotes avoiding foods they otherwise would devour. While in the case of my forest ranger neighbor, the amount of rodents no doubt outweighed the lesser desired waterfowl, and the continued good hunting near this chosen human remained peaceful as long as she avoided those particular birds, perhaps further urging and helping to condition her to leave them alone. But for those who have large numbers of free land-roaming, sheep, chickens, rabbits or beloved pets, and don't (in fact, shouldn't) experiment with the bonding process that took place with this experienced forest ranger, there's still more rays of hope for conditioning the coyote, as well as other predators, to leave our sheep, chickens and pets alone. 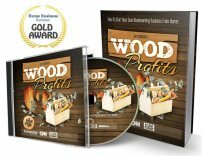 "How is CTA learned? For predators, eating follows an inevitable sequence. It starts with food seeking (appetitive) foraging behavior controlled largely by the fore brain. It is flexible behavior because it has to be. Foragers almost never know where food actually is or what it will do once it's located. By the time food actually gets into the mouth the brain stem largely takes over (salivation and gastric secretion begin) and this includes food taste sensation going to the brain stem. If the food has not previously been linked with illness, then the brain stem will allow it to remain in the mouth and to be swallowed. Next, it begins to be digested further. If the outcome of digestion and absorption is "good" (nutrient repletion), then all is well and this taste will be "remembered" by the brain stem as acceptable and so again be welcomed in the future. Since the food is still desirable, external cues associated with this food will continue to be sought by the animal as it forages in the external environment. That is, the unconscious brain stem decides what food the conscious fore brain "wants" to pursue. As they say, "You might be able to control what you do, but you can't so easily control what you want to do!" He goes on to explain those who dismiss CTA wrongly often try to retrain the fore brain of the animal, rather than the gut and brain stem, to try to obtain the desired conditioning, and that often doesn't work. Rather, to make it work, the absorption of food must create a bad experience, then the vagus nerve from the gut sends signals of distress to a specific area of the brain stem. If the animal recovers, there is a permanent lasting memory not only to avoid, but to heatedly dislike, that food. So, when done correctly, feeding a piece of mutton carefully injected with a specific substance, then wrapped in a little sheep wool can keep coyotes and wolves alive and part of nature, but condition them to avoid sheep like the plague. Nicolaus further explains why similar human attempts, such as tainting the food with hot sauce, or inflicting other punishments for eating the foods, haven't had the same effect as this one that works so well with that specific area of the brain. He goes on to explain how it is that it's not just the chunk of meat the animal learns to avoid after being fed the injected food, but can also learn to avoid the distant living animal associated with it. He describes how the "tainting" substance must be undetectable (which isn't the case with, say, adding hot sauce to the food), and just what that undetectable substance is. Further, he explains how the re-testing was done incorrectly, including how they added the illness-inducing substance in a manner that made it detectable, so therefore, ineffective. At this point, we can see that poisoning the food to kill the coyote does us no good. The animal dies, and a new animal that never learned to avoid that food, quickly takes its place and starts the problem all over again. Instead, if the coyote stays alive but learns to avoid that food, it will in essence, protect that domain from other coyotes that aren't conditioned, while it contributes to teach the others to avoid the particular pet, livestock or crop. As stated by Nicolaus, "For more than a century, coyotes have been extensively killed in the U.S. but both their range and their populations are actually expanding." We can also see that while the park ranger found a way to feed a coyote and keep it a wild hunter respectful of humans, residents in urban settings who set out food for coyotes or allow them to eat their garbage and find them coming closer to kill their cats and small dogs, may do better to do the opposite: Train them to find aversion to urban foods: garbage, fallen fruit, and pets. Instead, they are training them to associate humans and their yards with remembered eating pleasure, and nothing is being done about the pleasure they receive from eating cats, so they continue to increase the number incidences, even teaching the tactics to their pups. Nicolaus explains ways to condition wild animals in a manner that's humane to the prey animals we want them to avoid. .
Our pet cats…. While coyotes have a long history of avoiding wild cats, and Jon explains that many coyotes will still avoid domestic cats because of the possible danger from cats scratching their eyes to blindness… a serious problem for any wild animal. Yet we know that coyotes do find ways of taking our barn and pet cats as well. As mentioned, if they can be conditioned to avoid otherwise desirable food animals, they're also adaptable enough to be conditioned to learn to eat new animals they once avoided in the wild, in this case, felines. So CTA may further help protect domestic cats with coyotes that have learned to hunt them. But about pet dogs… The dog's interaction with the coyote is a different matter. According to Jon, our pet dogs are generally attacked by coyotes because they are canine competition in their territory, not as a source of food, and he has never witnessed coyotes taking dogs as food. While not practical for all, those with small acreage may find the best approach against coyotes killing dogs is to beat them at their own territorial game with a larger protective dog such as the Great Pyrenees, perhaps even in addition to the smaller family dog they already own, to let the coyotes know they don't stand a chance in this bigger dog's territory. Find a way to keep smaller dogs within this protected space, wandering outside of it puts them in the coyote's territory, who will do what all canines do, even our pet ones, vehemently try to eliminate the threat to their hunting grounds. Coyotes often find ways to get into a fenced area free of guard dogs, but will respect a large dog's territory, whereas smaller pet dogs often can be contained within that same fenced area, not being the sly Houdinis coyotes can be. To use a guard dog effectively and humanely, it will probably be best to work with a breeder experienced in farm guard dogs. In some cases, in spite of all efforts, puppies trained as guards don't do their work correctly, and breeders may help train the puppies to up the chances of it working out, and trade dogs with you until one works properly. Other predators, and additional tactics Black bears, domestic cats, ferrets, cougars, hawks and other predatory birds, wolves, and others besides coyotes have all been proven to effectively be conditioned with CTA. Humans have had some luck with other tactics, like hooking a dead chicken to a hot wire (dangerous around uninformed humans, especially children). No predators came near any chickens after their encounter with it. In fact, a neighbor became quite angry when his hunting dogs, which had come onto the farm's property, wouldn't even touch a pheasant after their incident of trying to fetch the 'electric chicken.' That case may have been closer to what Nicolaus calls 'aversion conditioning' or what others call 'food aversion conditioning' where the animal still likes the taste of the particular food, or the activity of pleasing its hunter master, but now won't go near it because of a new overwhelming fear of a great punishment. Conversely, CTA changes the animal's actual taste and desire. They don't necessarily have fear of the food source causing a form of punishment or pain, they simply don't like that food source anymore. Predators have even been seen to gag and vomit when being put near the food source they were conditioned to dislike. Aversion conditioning, vs. CTA, may be more effective when some sort of bond is also in place to add to the animal's desire avoid what it still likes (i.e. the canine who avoids a food that may cause punishment for eating it, but also because he sees his owner/pack member avoiding it, and his ability to absorb pack behavior guides him in this manner). Others have worked with nature's system of territorial rights by putting up replicas of large eagles, informing other eagles and smaller birds of prey that this domain is taken. If the "eagle" remains immobile over time, the animals will adapt to this ineffective, possibly dead bully, and go right ahead and move into his territory. That's another reason by CTA can be so effective. Live, healthy, animals actively chase away invaders intruding into their territory. My neighbor's coyote? He said she was eventually shot by another distant neighbor. But lurking in the shadows is another coyote that's waiting for nightfall. It could be waiting for many things, including for the right time to teach its pups how to cross a street without being hit by a car. Coyotes are very attentive parents, going through grief if ever separated from their families. So, what if we learned to live peacefully with this and other predators? Conditioned Taste Aversion may be one tool to help make this happen.